Now that many state licensing organizations have joined the Joint Commission in requiring addiction treatment programs to use patient-reported feedback to inform clinical care, centers are exploring a variety of different options. Some companies are looking into building their own entire system from scratch and others are hoping their electronic medical record system can do it for them. EMR systems are interesting. The good EMRs – those that allow you to easily access patient records and efficiently enter clinical notes and treatment plans -- are worth their weight in gold. But even the best EMRs have struggled to perform other crucial business operations such as billing insurers, ordering lab testing, etc. And that’s why most treatment centers choose to utilize services that specialize in these areas to make sure they get the best results. Outcomes measurement is no different. A number of EMRs are now claiming that they can help their clients comply with the new outcomes measurement requirements. What they typically mean by this is that they can push surveys to patients. While this is important, collecting survey responses is only the first step in using patient-reported data to improve treatment results. Raw data in .csv files waiting to be analyzed doesn’t do anyone any good. Someone needs to take responsibility for systematically analyzing the data and presenting it in easy-to-understand graphs so that clinicians can actually use it to inform clinical care. And this should really be done on at least a daily basis. Who’s going to be responsible for taking the survey responses and turning the raw data into meaningful results? How frequently are they going to do this, and what happens when they’re on vacation or quit? Are you comfortable taking the risk that a patient reports dangerous thoughts or behaviors and no one notices for days or, heaven forbid, ever? A lot of patients ignore survey requests. Is it going to be easy for your staff to see who needs to be followed up with? Are the particular scales being offered those that would be most useful in identifying the main issues that are keeping patients from getting better? Or, asked another way, when a poor score is reported, will it be clear to your clinicians how they need to modify the treatment plan? When it is time for your next accreditation or licensing survey, are you confident you’ll be able to prove that the majority of your patients have been enrolled in progress monitoring, that they’ve been submitting a reasonable number of surveys, and that your clinicians have been using these results to inform clinical care? 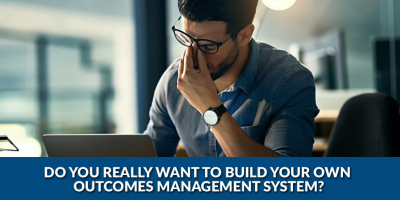 Is your system going to give you the data you need to manage your program effectively, such as analyzing whether treatment effectiveness is improving over time and identifying potential areas for improvement? Vista Research Group has spent the last two years building an easy-to-use system that handles all of the above for you. Vista focuses on only one thing -- making it easy for behavioral health care programs to use patient-reported data (collected both during and after treatment) to improve treatment results -- and we do it VERY well! If you’d like to how Vista makes outcomes measuring easy, please call our friendly research experts at (800) 215-3201 x1 or download one-page summaries showing the type of data INSIGHT Addiction™, INSIGHT Behavioral™ and RECOVERY 20/20™ report to our clients. Thank you very much!